Liposomes are lamellar structures composed of a lipid bilayer. They are used as carriers for different drugs. The present paper reviews the use of intravenous liposomal anticancer drugs in dermato-oncology. The broadest application is found today for liposomal anthracyclines, i.e., doxorubicin and daunorubicin. The practical experiences with liposomal drugs in skin cancer are still limited. There is clear evidence for liposomal drug efficacy and safety in AIDS- related Kaposiâ€™s sarcoma. Their use in other conditions, such as cutaneous T-cell lymphoma, malignant melanoma and cutaneous angiosarcoma, has been investigated in uncontrolled trials. The preliminary data, however, are promising in particular for cutaneous T-cell lymphoma. Atopic dermatitis (AD) is a chronic, relapsing dermatitis commonly affecting children. 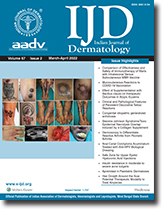 Various epidemiologic factors and clinical patterns of the same were evaluated in 125 patients out of 418 attending the pediatric dermatology clinic over a period of 11/2 years. Of these, 26 were infants (upto 1 year of age) and 99 were children. Mean duration of the disease in the infantile group was 3 months while in the childhood group it was 6 years. In the infantile group, family history of atopy was found in 11 patients (42.3%), while in the childhood group 35 (35.35%) had family history of atopy, 7 (7.07%) had personal history of atopy and 2 (2.02%) had both personal and family history of atopy. The infantile group had more frequent facial involvement and acute type of eczema, while in the childhood type, site involvement was less specific and chronic type of eczema was more frequent. Most of the patients had mild to moderate degree of severity of the disease. Androgenetic alopecia (AGA) is one of the most common causes of hair loss in genetically predisposed men and women. We studied the therapeutic efficacy and safety of oral finasteride in male patients with AGA. A total of 40 male AGA patients, 18-35 years of age, wad enrolled in the study for a period of 9 months. Oral finasteride, 1mg/day, was started and the drug efficacy was assessed on the basis of pre- and post-treatment clinical photographs, trichogram, hair pull test and self assessment of hair re-growth by the investigators. Routine hematological and bio-chemical investigations and a questionnaire related to sexual disturbances were carried out to assess the safety profile of the drug at each follow-up visit every three months. Improvement in hair growth was observed by comparing the paired pre- and post-treatment global photographs (p<0.05), decreased hair shedding by the patientsâ€™ self assessment (p<0.05), hair pull test evaluation (p<0.001) and increase in anagen-telogen hair ratio (p<0.001) with the trichogram, as early as 3 months of finasteride therapy with maximum benefit in the mid-area followed by vertex and frontal areas. No significant side effect related to the drug was observed. It is concluded that oral finasteride is a relatively safe, well tolerated and efficacious drug for AGA in Males. A comparative study of topical methotrexate and topical tar in eighteen patients of localized psoriasis with bilateral involvement of both lower legs, equal in area and disease severity was carried out. The patients were asked to apply topical methorexate 0.25% in a hydrophilic gel twice daily on right leg. The test sites were score, before therapy, after one month and after two months. The result with topical methotrexate preparation was promising but was comparable to topical tar formulation. The aim of the study was to compare efficacy, onset of action, and sedative effects of cetirizine (CTZ) and levocetirizine (levoCTZ) in chronic idiopathic urtcaria with fifteen patients in each group. They were found to be equipotent and the onset of action was almost same. Twenty percent in CTZ and 13.33% in levoCTZ exhibited mild sedation. An open uncontrolled trial, to assess the efficacy of ketoconazole 2%+zinc pyrithione 1% shampoo was conducted in patients with extensive tinea versicolor. The results show that this is an effective and well tolerated combination in the management of tinea versicolor. Acute febrile neutrophilic dermatosis (AFND), commonly known as Sweetâ€™s syndrome, is a disorder seen in adult females, being extremely rare in children. Typical features include spiky fever, sudden eruption of raised painful erythematous to plum-colored nodules and plaques, neutrophilic leucocytosis, a dermal neutrophili infiltrate an a rapid response to systemic steroid. The eruption is believed to represent a hypersensitivity reaction to an antecedent infection or malignancy. There have been rare reports of acquired cutis laxa (Marshallâ€™s syndrome) following Sweetâ€™s syndrome. We report one such case of Sweetâ€™s syndrome leading to acquired cutis laxa (Marshallâ€™ syndrome) in a child. A case of Melkersson-Rosenthal syndrome with swelling of lower lip, facial palsy and fissured tongue is reported because of its rarity along with a brief review of literature. A case of bullous congenital ichthyosiform erythroderma (epidermolytic hyperkeratosis or EHK) with some unusual features is described. It was diagnosed in a 6 month old girl with no family history of either EHK or focal lesions suggestive of mosaicism. The girl probably had EHK type NPS-2; but non-involvement of face and lack of foul body odor set the case apart. We describe two cases of neurofibromatosis type I with innumerable pigmented macules involving whole integument including palms and soles with only occasional neurofibromas and seek to differentiate the condition from other genodermatoses with pigmentary anomalies. Alkaptonuria is a rare, autosomal recessive disorder of phenylalanin/tyrosine metabolism due to congenital deficiency of the enzyme homogentisic acid oxidase. The diagnosis is clinical and the triad of homogentisic aciduria, ochronosis and precocious degenerative arthritis is characteristic. Its diagnosis in infancy and early therapeutic intervention help delaying its complications. These patients may remain undiagnosed until the darkening of urine soaked diapers is noticed or the early degenerative arthropathy develops. This paper describes two cases of alkaptonuria presenting late in life; one of them had associated hyperthyroidism. A 57 year old female presented with generalized erythematous scay plaques of 11/2 months duration and jaundice since 1 month. She was on leflunomide since 3 months for chronic rheumatoid arthritis. Investigations revealed positive ANA, rheumatoid factor and negative anti-DsDNA. Bilirubin and liver enzymes were markedly raised. Viral markers were negative. Direct immunoflourescence did not show lupus band. A diagnosis of drug induced hepatitis and skin rash was made. She was treated with cholestyramine but she died after ten days of hospitalization. Spread of lichen planus along the course of striae was noted in a 24 year old primigravida in the sixth month of her gestation. The case is reported for this unique presentation.